Gemini apples are medium- to large-sized and ripen by late August. All fruits begin as flowers. 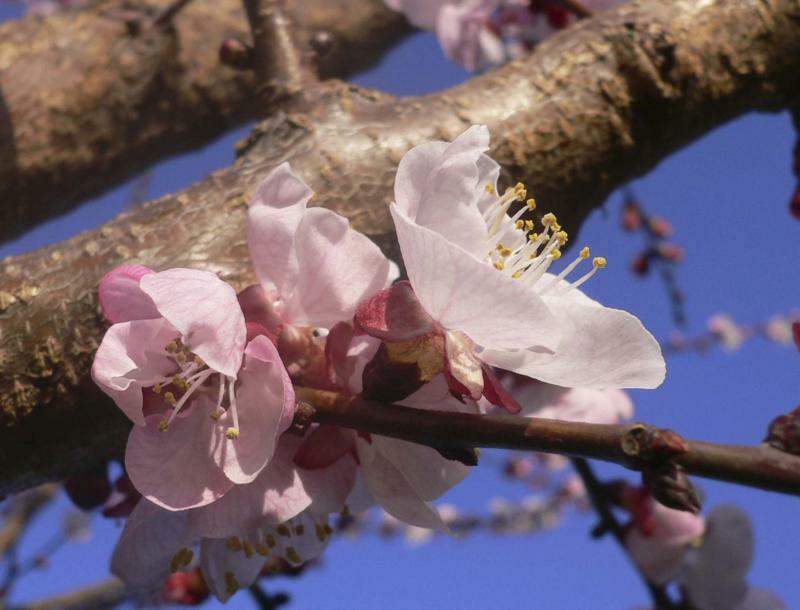 Apricot's pretty pink blossoms bloom very early, making them susceptible to frost. If frost hits, it can result in crops that can be hit and miss some years. Need some help harvesting your bounty of fruit? Fruit share volunteers will come to the rescue. For successful fruit production, grow two different pear cultivars. Pick pears once they are green-yellow. 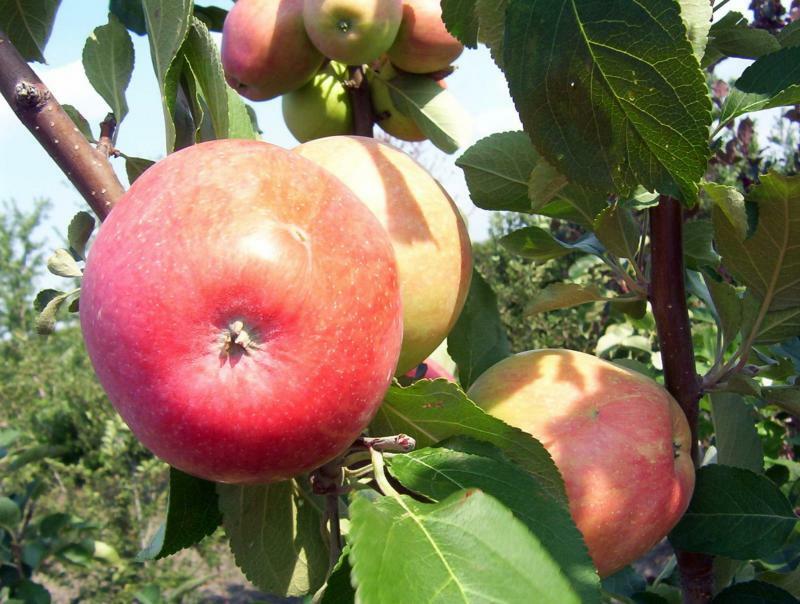 Developed by Wilfred Drysdale of Neepawa, Prairie Magic apples matures in mid-September. 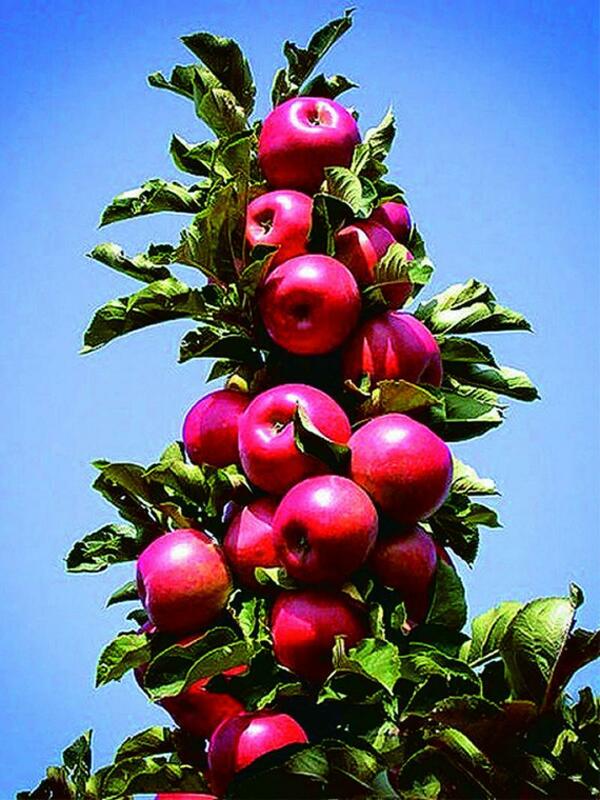 If you're short on space but want an orchard of your own, consider TreasuRed, a columnar apple designed for small spaces. The desire for fresh taste is driving demand for fruit trees and, in particular, varieties grown on dwarfing rootstock. Philip Ronald, owner of Riverbend Orchards, says apple trees are the No. 1 selling fruit crop and a major plant for Prairie growers. Super compact dwarf apple cultivars are half the size of heirloom varieties traditionally grown in our northern climate. There are important advantages to grafting hardy cultivars on dwarfing rootstock, Ronald says: the resulting fruit varieties use less space and are easier to harvest and maintain. Fruitfulness and quality of fruit on size-controlling rootstock is not affected. Indeed, Ronald says, an abundance of fruit is produced sooner on dwarf cultivars (up to two years earlier) compared with standard rootstock, in part because excessive vegetative growth is suppressed. In Manitoba, Ronald says, the best apple for size, quality and fresh eating is the Goodland apple. Grown on Bud 9 dwarfing rootstock, Goodland was developed at the Morden Research Station and introduced to the market in 1955. Goodland’s large fruit (six to eight centimetres) ripens in mid-September. 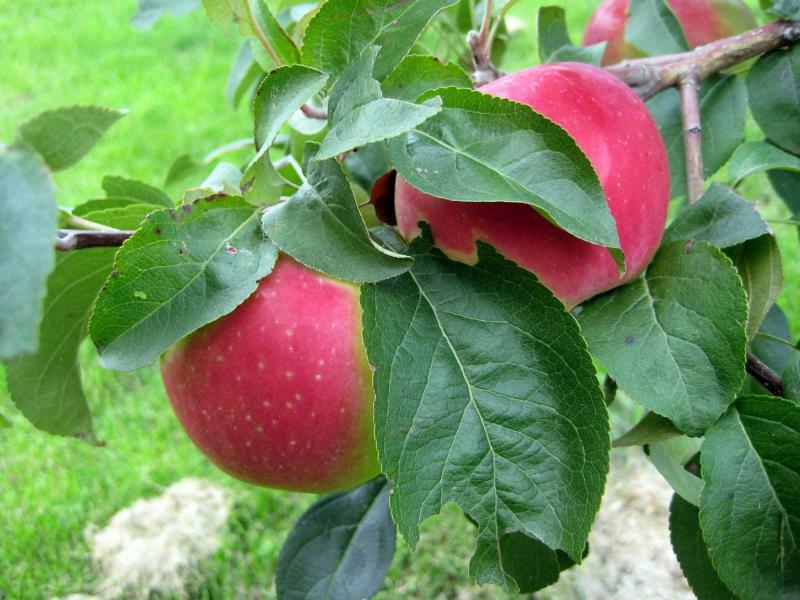 Gemini and Norkent are two other fruitful dwarf apple varieties that also receive top marks. Both produce medium to large-sized apples that ripen in late August. Both Gemini and Norkent apples store well, although Goodland apples store longer (up to 20 weeks). When storing apples, Ronald recommends keeping different cultivars separate from one another. 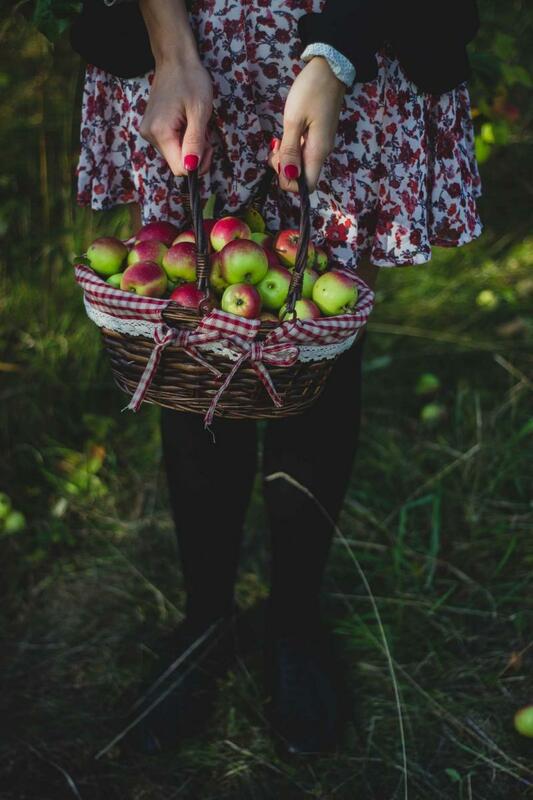 In order to maximize their shelf life, apples should be stored in breathable containers at temperatures around 1 C or 2 C. "Avoid storing apples with other garden produce, such as potatoes and onions," Ronald advises. Ronald also recommends Odyssey and Prairie Magic, both of which mature in mid-September. Prairie Magic was developed by Wilfred Drysdale of Neepawa. Marion Lewis is someone who appreciates fruit trees and can attest to their longevity. She has a small fruit orchard, which she started shortly after 1967 when she purchased a three-acre property a few minutes south of St. Norbert. A retired professor who taught at the University of Manitoba, Lewis and her colleagues at the Rh Laboratory became internationally renowned for their work in the field of blood group gene mapping. Now in her early nineties, Lewis maintains numerous fruit trees including apple, pear, cherry and plum varieties. Next spring she plans to add apricot trees. Lewis grows Dolgo crabapple, a large and very decorative landscape tree. The showy white blooms have ornamental value and the brilliant crimson fruit are great for making jelly. Despite the mostly dry conditions this past growing season, Lewis enjoyed a bountiful harvest. Her pear trees, purchased in Morden about 40 years ago, produced a bumper crop this year, although Lewis says she has a good crop every year. No doubt it has something to do with the ideal sun-filled location and yearly additions of well-rotted compost. Although the plant tags have long since disappeared, one is likely Ure, which was developed at Morden in 1978. Pears, as with apples, require two different varieties growing in close proximity for successful fruit production. 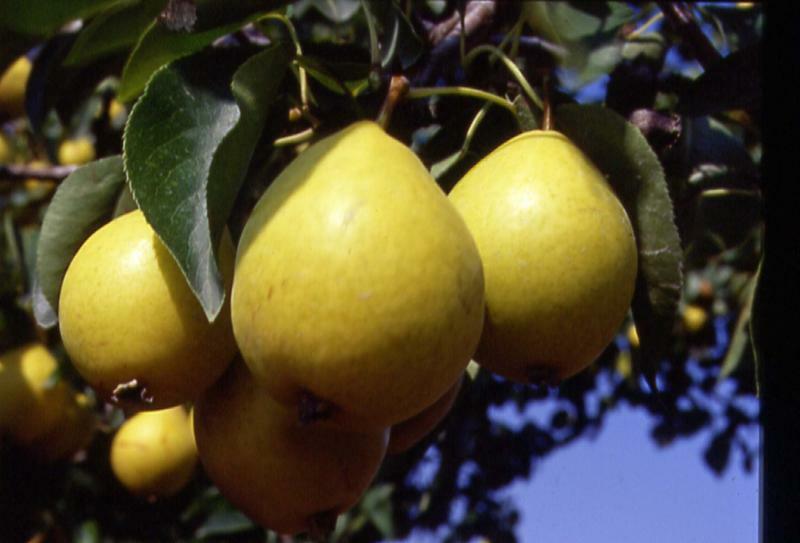 Pears, which can turn mushy, should be picked when they are green-yellow. Lewis makes a mouth-watering pear and ginger marmalade rich with candied ginger and lemon slices. I confess that I have only an empty jar left, having quickly devoured it rather than slowly savouring. Lewis also grows dwarf sour cherries. In Manitoba, the breeding of dwarf sour cherries began in the 1940s by Dr. Les Kerr at the Morden Research Centre. Lewis makes roast duck with sour cherry sauce and combines sour cherries with sugar, vanilla and whipping cream, which she spreads over ladyfingers. It’s always helpful to have someone do the heavy lifting or drive the tractor. Lewis is fortunate to have the assistance of Earl Stafford, a friend and former neighbour who is known for his tenure as the Royal Winnipeg Ballet’s music director and principal conductor for 25 years until retiring in 2009. Last summer, I accompanied Lewis and Stafford on a tour of Riverbend Orchards to look at fruit varieties but also best practices. Ronald protects each fruit tree with a tree guard to deter rodents from chewing on the bark. Sunscald, Ronald says, can be a real problem for apple trees. To protect the bark from overheating, Ronald sprays the southwest side of the trees with white latex paint to reflect the strong solar radiation that occurs in March. Ronald grows only a few apricot trees and has had the most success with Debbie’s Gold, a Manchurian apricot variety cultivar that produces pretty pink blossoms followed by freestone, orange-yellow fruit. Apricot trees flower very early and so are frost susceptible, Ronald says. Debbie’s Gold blooms later than other varieties but fruit production may still be inconsistent owing to the risk of an early frost. "The value of shelter cannot be overstated," says Ronald, who has planted his row of apricot trees against the east face of a tall evergreen shelter belt. Apricots require a pollinator. Ronald uses Mount Royal plum and suggests planting spring-blooming perennials at the base of trees to attract bees. Mulching is also important. Worried about waste if you are unable to pick a bountiful harvest? Katie Anderson, co-ordinator of Fruit Share, says this year volunteers conducted 80 harvests, which resulted in more than 7,000 kilograms of fruit diverted from landfill to food and compost. Anderson says many of the homeowners who registered with Fruit Share in the past have connected with dedicated pickers who come back year after year to harvest their fruit. "Our match-making service is often successful long-term for fruit owners," she says. How many fruit trees does it take to make an orchard? The standard rule is a minimum of five fruit trees. Not enough space for trees in your compact yard? Consider Treasured Red apple, also known as TreasuRed. A recent introduction from the University of Saskatchewan’s fruit breeding program, it has a narrow columnar form with a mature width of one to 1.2 metres. Mature height is only four metres. Instead of developing horizontal branches, fruit is formed on short spurs that develop along the main trunk, Kevin Twomey at T & T Seeds says. The fruit ripens in mid-September. TreasuRed is sold as a 30- to 45-centimetre seedling in a 13-cm pot. Twomey says this columnar apple tree, if planted in multiples, would lend itself well as a privacy screen or hedgerow for even the smallest of properties. "We can’t keep up with demand," says Twomey, who recommends pre-ordering the tree once the 2018 T & T Seeds catalogue comes out later this month. Growing your own fruit provides access to fresh, healthy produce. With numerous Prairie-bred cultivars to choose from, fruit lovers can’t go wrong. It’s cheaper to grow your own food, too. "I’m on an income that hasn’t changed for 15 years," Lewis says, "and yet, everything is getting more expensive. It’s important to me to use what I grow but also, homegrown fruit doesn’t have any preservatives. It’s pure and that’s what I like."